Saturday October 13th I decided to go run this 5K with my regular training partner Karla. This was a very important date as a year ago I went with Karla and Frank and Jerry to UNC Hospital for Karla's last chemotherapy session. 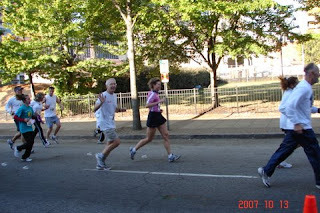 Amazingly, the day afterwards I ran with her in this race as she bravely ran a 33:04. Since that time, she had completed her radiation treatments and being declared cancer free last December, began looking to return to her pre-cancer condition. Now a year later it is with great joy that we are able to run together regularly again and I see her steadily growing stronger. Over the past several weeks we have done several long runs up to 18 miles in preparation for a return to the OBX Marathon in November. I arrived in downtown Raleigh early to get in some running before the race and after a 2 mile warm-up, I ran the course at tempo pace. The course was not yet closed to traffic so I had to slow or stop at several intersections and was nearly impaled by a giant fork-lift as I ran through a construction zone. I then began looking for Frank and Karla. She was surprised to see me since I had not told her I was coming. I needed to be at work at 10am but I decided I could run with her and it would only be a 10 minute drive to work and I would have plenty of time. It was 8:30 when I found them so after chatting briefly with Frank and Mike Walsh, Karla and I went for a warm-up before heading to the start. It was a beautiful morning, in the 50's and warming quickly into the 60's. A couple of weeks ago we ran a 5K fun run on the greenway with the NCRC during the club's Thursday night Sept Series and she had run about 28:34, her fastest time in nearly two years so I told her we should shoot for a sub-28 time today. She expressed doubts about it, but was ready to give it a shot. After the gun, we started out strong but reserved. As usual I was chatting away, happy to be running easily alongside the Marathon Princess. Karla was talking too, a good sign she was feeling good and the pace was not too fast. We hit mile one in 8:35, probably her fastest mile in a very long time and a big boost to her confidence. The next half mile is a slight downgrade and we passed the halfway mark in 13:30. Having a severe case of long-term ultrabrain, I was having a hard time thinking mathematicly, but I soon realized that she was not just on pace to break 28 but was headed for a possible sub-27. As we past the two mile mark, she was still looking good but feeling the strain of the pace but she is obviously one tough lady and wasn't backing down at all. Then with the finish in sight and knowing she had a sub 27 in the bag she kicked hard and crossed the line in 26:30 !!! Woohoo!! I was so proud of her. A brief celebration and a visit with friends Bill and Sally Squier and I had to hurry off to work. Next up is the ATT 10 miler next Saturday as a test for my marathon preparation.